Although this is nowhere near as good as the other two, part three of this great franchise does have some great moments, although few and far between. The Empress dowager tries to restore national pride by holding a lion dance competition, only to have it quashed by martial madman Chiu Tin-bai (Chiu Chin) who is keen to annihilate the competition. Wong Fei-hung steps in after his father is beaten down by Chiu’s nutty henchman Clubfoot (played by former Jet Li stunt-double, Hung Yan-yan) and the stage is set for a big kung fu take-down. The lion dance sequences are colourful but Jet is still the most exciting thing here. 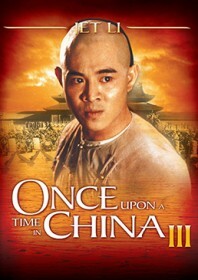 What the film lacks is a sense of purpose, and Tsui Hark’s seminal trilogy ends with more of a limp than a bang.